On Monday I posted a single dungeon geomorph hex tile. Today, as promised, I’m giving you a set of seven of them. These aren’t perfect yet – I’m still experimenting with them. In trying to add lots of potential join points (there are 3 spots available to me on each side that I can use to exit the tile) I’ve ended up with quite a few hard breaks once the tiles are put together – that is, there are plenty of spots where a room or tunnel meets the side of its geomorph and immediately runs into a straight line of hatching on the next one. This will obviously happen – it’s just how geomorphs work – but with a little more thought I’m sure I can come up with a system to a) minimise this and b) make it look better when it does happen. They’re also not all exactly the same size yet. They’re close, but not perfect. I want them to be perfect. That will come with time. The final issue, really, is that 7 really isn’t enough geomorphs to create a lot of interesting combinations. I’ve really enjoyed drawing these, though, and I’ll definitely be adding to them. I’d love to hear what you think of these, and if you’d like to see more of them. I’m planning to do a whole lot more caverns and tunnels, and then to work on some more traditional dungeons with rooms, traps, etc. Print them off, put them together, and let me know how they work for you! I’ve struggled a lot this past week to find ideas for things – Stat Boost was a struggle, my game this weekend took much longer to put together than it usually would, and this map is almost a full day late because I simply drew a blank. In a bid for inspiration, I started looking through some of my favourite maps by other artists. In the process of doing so, I realised that I’ve amassed a huge collection of geomorph tile sets, but have never actually tried to draw my own. I think the first time I encountered dungeon geomorphs was probably through Dyson’s post about them – a post which is worth checking it, because it contains both Dyson’s incredible maps and links to a few other excellent collections. One thing that struck me is that most of these dungeon geomorph sets are square – people have produced hex sets for overland mapping, but rarely for dungeons. 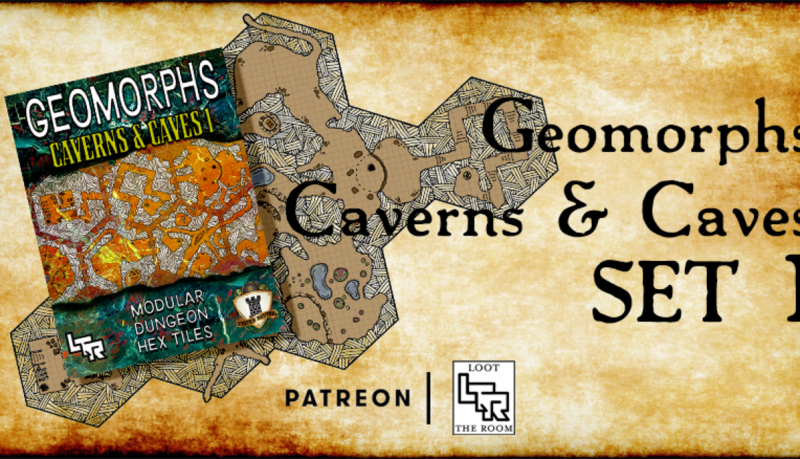 In a bid to provide something a little different to the work that others have already done, I’m going to go ahead and try to build a set of dungeon geomorphs on hexes. We’ll see how it goes. Now, you’ll notice that most people who produce geomorphs do sets of them that connect together – of course they do, because that’s the point of them. But this post is incredibly late already, and I didn’t want to delay it even further by drawing multiple maps. So this is just one map for the time being – a proof of concept, if you will – and in Wednesday’s Stat Boost I’ll post a set of six of them. This is probably going to become an ongoing project for when I don’t have something really cool in mind that requires a unique map; when I do post more of them, I’ll endeavour to provide more than just one geomorph. So, with that over, here’s the map. As always, click to embiggen.